Last Wednesday, Lent began with the Rite of Ashes, and today is the first Sunday of this liturgical time that makes reference to the 40 days Jesus spent in the desert, after his baptism in the Jordan River. 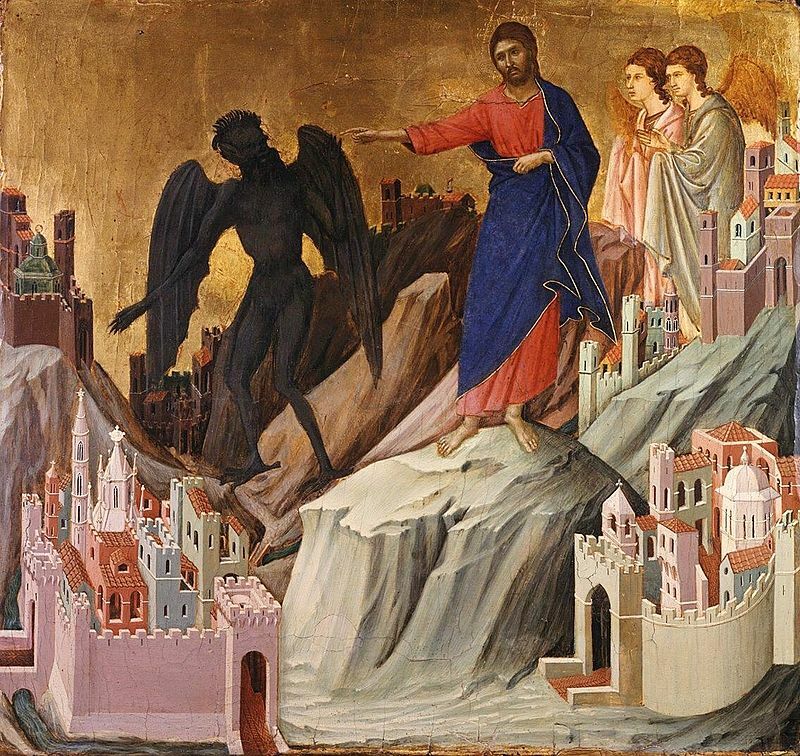 In today’s Gospel, St. Mark writes: “The Spirit drove Jesus out into the desert, and he remained in the desert for forty days, tempted by Satan. He was among wild beasts, and the angels ministered to him” (1,12-13). With these simple words, the evangelist describes the test voluntarily faced by Jesus, before beginning his Messianic mission. It is a test in which the Lord leaves victorious and that prepares Him to announce the Gospel of the Kingdom of God. He, in those 40 days of solitude, confronted Satan “in close combat”, He unmasks his temptations and conquers him. And through Him, we have all conquered but we must protect this victory in our daily lives. The Church reminds us of that mystery at the beginning of Lent, so that it may give us the perspective and the meaning of this time, which is a time of combat. Lent is time of combat! A spiritual combat against the spirit of evil (cfr. Collective Prayer of Ash Wednesday). And while we cross the Lenten “desert”, we have our gaze fixed upon Easter, which is the definitive victory of Jesus against the Evil One, against sin and against death. This is the meaning of this first Sunday of Lent: to place ourselves decisively on the path of Jesus, the road that leads to life. To look at Jesus. Look at what Jesus has done and go with Him. This path of Jesus passes through the desert. The desert is the place where the voice of God and the voice of the tempter can be heard. In the noise, in the confusion, this cannot be done; only superficial voices can be heard. Instead we can go deeper in the desert, where our destiny is truly played out, life or death. And how do we hear the voice of God? We hear it in his Word. For this reason, it is important to know Scripture, because otherwise we do not know how to respond to the attacks of the evil one. And here I would like to return to my advice of reading the Gospel every day. Read the Gospel every day! Meditate on it for a little while, for 10 minutes. And also to carry it with you in your pocket or your purse. But always have the Gospel in hand. The Lenten desert helps us to say no to worldliness, to the “idols”, it helps us to make courageous choices in accordance with the Gospel and to strengthen solidarity among the brothers. Now let us enter into the desert without fear, because we are not alone: we are with Jesus, with the Father and with the Holy Spirit. In fact, as it was for Jesus, it is the Holy Spirit who guides us on the Lenten path; that same Spirit that descended upon Jesus and that has been given to us in Baptism. Lent, therefore is an appropriate time that should lead us to be ever more aware of how much the Holy Spirit, received in Baptism, has worked and can work in us. And in the end of the Lenten itinerary, in the Easter Vigil, we can renew with greater awareness the Baptismal covenant and the commitments that flow from it. To Her I entrust, in particular, the week of Spiritual Exercises, that will begin this afternoon, and to which I will participate in together with my collaborators of the Roman Curia. I ask that you pray for us, that in the desert of the Spiritual Exercises, we may listen to the voice of Jesus, and also correct so many defects that we have. And to also confront the temptations that attacks us every day. I ask you therefore to accompany us with your prayers. I give a cordial greeting to the families, to the parish groups, the associations and to all the pilgrims from Rome, from Italy and from various countries. I greet the faithful from Naples, Cosenza and Verona, and the youth from Seregno who have come for the profession of faith. The volunteers will distribute them, among whom there many homeless people who have come on pilgrimage. And as always, here in the square, with those who are in need, they are the same ones who bring us a great wealth. The wealth of our doctrine, to guard your heart. Each one of you take a booklet and carry it with you, as a help for spiritual conversion and growth that always starts from the heart: there where the match of daily choices between good and evil are played, between worldliness and the Gospel, between indifference and sharing. Humanity is in need of justice, of peace, of love and will have it only by returning with their whole heart to God, who is the source. Take this book and read it. I wish you all a Good Sunday. Please, especially in this week of [Spiritual] Exercises do not forget to pray for me. Have a good lunch and goodbye. This entry was posted in Lent, Pope Francis and tagged Jesus, Lent, Pope Francis, spiritual combat, Sunday Angelus by texasnuns. Bookmark the permalink. A prayer for Pope Francis….